Wash and dry your jars, then paint two coats of acrylic paint to the outside of the jar, drying between coats for 30 minutes. Allow the jars to dry completely. Draw simple skulls on a piece of paper, small enough to fit on your jar. Place a piece of contact paper over the drawing, clear side facing up. Trace the pattern onto the contact paper. You want the outside of the skull to remain intact, so cut the skull out from the inside. Cut out eyes and nose as well as you will need those separately. Press the contact paper with the skull cut-out onto the jar, making sure there are no air bubbles and that all sides and stuck down. Press the contact paper eyes and nose in place. Dip a cosmetic sponge into black paint and remove the excess paint by dabbing it up and down onto a paper towel or paper plate. With a straight up and down motion, apply paint over the top of the stencil. A second coat may be needed, but allow it to dry for just a minute or two first so you don’t lift off your first layer. Carefully remove the contact paper stencils. The pointed end of a craft knife can be used to gently coax the edge of the stencil up, but be careful not to scratch the paint. Use tea light candles or battery operated LED tea lights to illuminate your jars! There are special paints made for glass called enamels. Regular acrylic craft paints will work, but if you would like your luminaries to last season after season, it’s best to use enamel paints or a multi surface paint that works on glass. If you choose to use acrylic paint, spraying them with a clear gloss thick sealer will help preserve them as well. 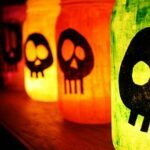 This project for Colorful Skull Luminaries for Halloween was printed from CraftsbyAmanda.com - https://craftsbyamanda.com/colorful-skull-luminaries-halloween/ and can only be printed for education or personal use.